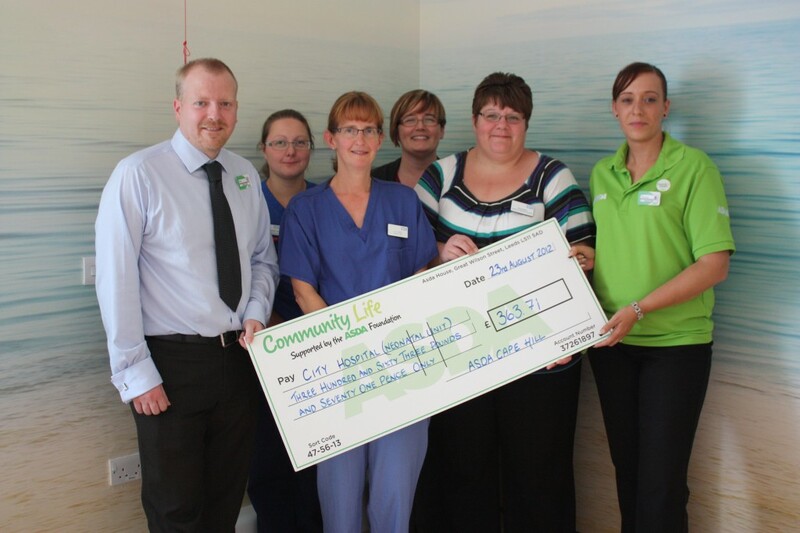 NURSES at City Hospital’s neonatal unit were delighted when they received over £300 from ASDA in Cape Hill. The unit received £200 after being nominated by customers to receive a charitable donation. A further £163.71 was donated after supermarket workers surprised hospital staff by holding a charity day on Saturday 18th August. Cheryl Walne, Neonatal Unit Matron, explained: “We didn’t know they were doing it until the Tuesday before. Customers, staff from the unit and supermarket employees were encouraged to get involved by teaming up to cycle 200 miles in a day on static bikes and making donations in buckets. The cash has been gratefully received and will be used to provide activities for the siblings of the babies on the ward. “The money will be used for activity packs for the siblings that come on the unit and we’re looking to get some pictures developed of babies in incubators so they can colour them in.